God Lives Underwater does not consider themselves an industrial band. Despite the fact that their music shares some sonic components associated with that genre, GLU consider themselves a rock band that handles keyboards. But their newest release on PolyGram records, Life in the So-Called Space Age, demonstrates their eclectic product with strong, synthesized tones sure to label them as an industrial band. GLU has two prior releases that were more hard-hitting and rock based than Life in the So-Called Space Age. Empty, on American records, earned them a winning single with “All Wrong” as well as four videos. The new album takes a more mellow approach with heavy keyboards and less guitar. 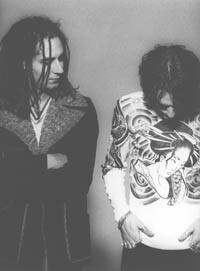 GLU sounds industrial, but unlike the monotonous beat of most techno-synth bands, they have style. GLU’s slower, churning beats and appropriate musical transitions make Life in the So-Called Space Age a good album. The songs are just long enough; GLU doesn’t make the same mistake that many industrial artists do by dragging songs out for eight or ten minutes. So if you like industrial music, give God Lives Underwater a chance. There are enough good songs on the new album to make it worth it, and they are all under eight minutes. What more could you ask for?